The Global Residence and Citizenship by Investment industry is set to reach $20 billion by 2020. There are estimated 30 such schemes running worldwide and there are competition between countries to attract wealthy families from China, South Africa and developing countries. According to WealthX, it is estimated that HNW population is set to grow by 40% and investment migration will play a key role to bring foreign direct investment. Portugal, Greece, Cyprus have been struggling with economy and debt few years ago, introduced golden visa schemes, and now economy has recovered and GDP is growing in positive direction. Thailand Elite is the cheapest residency program, while UK, New Zealand has the most expensive residency program in the world. Cyprus has the most expensive citizenship investment scheme in the World. 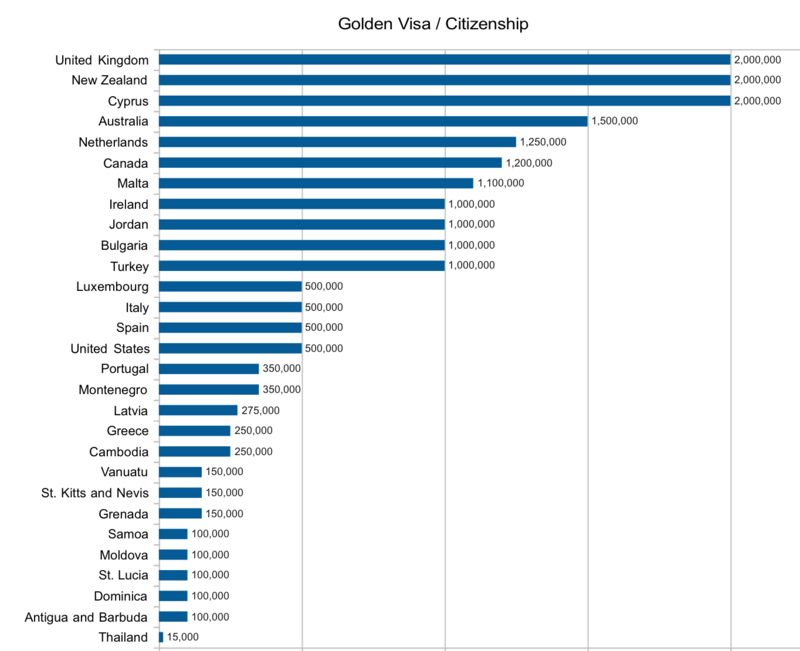 We have compiled a full list of Citizenship by investment (CBI) and Golden visa schemes currently available.